This is a two-bedroom apartment with a big size balcony. One bedroom has a queen bed and a crib. 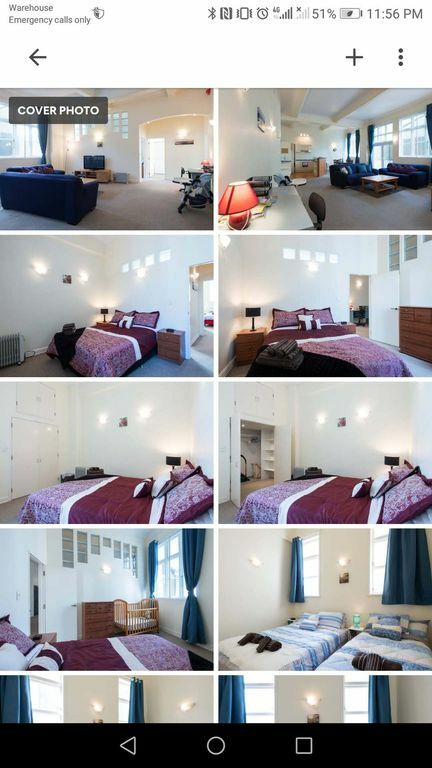 Another bedroom has a queen bed and a single bed (see photos). The apartment’s ceilings is about 4 meters high and curved, and floor area is 100 square meters. This is a family friendly apartment with crib, high chair, pram, baby bath tub, digital baby monitor and toys. The apartment building has just installed a brand new passenger lift so my apartment is stairs free for wheelchair access. On your arrival we provide complimentary refreshments such as a bottle of New Zealand wine, bottles of spring water and cookie. We also provide complimentary breakfast, fresh milk, coffee, variety of teas. The apartment building is located at the heart of Wellington entertainment district. One bedroom is above pub so noise at night. However, we provide complimentary the USA made MACK Ultra Soft Foam earplugs to ensure our guests have good sleeps. There are TV, washing machine, laundry powder, cloth dryer, hair dryer, iron, heater, fan, microwave, refrigerator, oven, stove, dishwasher, cooking basics, dishes and silverware, fire extinguisher, smoke detector, first aid kit in the apartment. Guest use lockbox to self check in. My apartment does not have a car park in the apartment building but there are lot of car parks next or near the apartment building. I am a senior consultant in the insurance industry. I have three little kids. I can speak English, Mandarin and Cantonese. Extremely unhappy with how I was treated by the owner of the apartment. He arrived unannounced at around 9pm. I was in the process of having a few drinks with two other friends before heading into town. He said I had to get out because the noise was loud (it was not) majority of the noise came from the bar and TimeZone downstairs. He proceeded to say I had lied to him about the reason why I stayed there but I in fact was not lying as I had attended a wedding but I feel this was irrelevant as to why I was staying there. As I was stressed about what to do, my friend asked him if we paid extra money then could we stay then he said yes, our things could stay but we had to get be back at 12 the next day to clean up. Knowing this was not right I asked my mother to come and help me sort this out. When she arrived he started yelling at her saying that we hadn’t paid for the room. My mum showed proof that we had. He refused to listen and my mum said that we would not leave until we got a refund. He called the cops and gave them a one sided story, my mum spoke to them also and they said we had done nothing wrong and he was to sort it out and not waste their time. This is unacceptable!!!! My weekend was ruined because of what the owner Jason Zhao had done. Although the issue was resolved, I feel my privacy was breached and will definitely not be staying here any time soon. We loved staying here, so convenient - good for late night owls who like the night life. The night life is right below, with a beer garden full of people & music going until 3am in the morning. Wonderful kitchen & bathroom- great shower. We'd definitely come back here.